A major concern in the field of chemical science is the proper care and disposal of hazardous wastes. With high-performance liquid chromatography (HPLC) machines, solvent wastes must be contained for disposal. However, these liquids are often volatile organic compounds (VOCs), meaning they will easily vaporize in the lab and spread through the air. In order to contain these vapors, which are potential health hazards for people working in the lab, improved waste containment must be implemented. Common lab practices have not been sufficient in containing these vapors. However, technology has become readily availa- ble to improve the containment of volatile liquids and prevent vapors from escaping into la- boratory air. Closed system waste containers with activated carbon filters not only create an organized containment for HPLC solvent waste, they also provide an efficient way to collect and dispose of vapor wastes. Providing a safe work environment is imperative in any field and compromise is not an option when it comes to work safety and health. An unfortunate consequence of chemical use is the production of hazardous waste. Disposal of this waste is often highly regulated and containment of waste is important to pre- vent adverse health effects. Many waste products produced in a lab are in liquid form, making containment a simple issue to resolve. However, when these liquids are volatile organic com- pounds (VOCs), they are likely to release a vapor form of the chemical into the air. While some of these vapors present a smell, many are unidentifiable and workers are not acutely aware of them. Although there is little research on the effects of these chemical vapors on hu- man health, it is clear that inhaling these vapors puts people at risk for a multitude of symp- toms including: sensory irritation, difficulty breathing, toxicity to the liver and neurological sys- tem, and cancer.1 Many of the currently accepted waste disposal techniques are not adequate to protect labs from these potentially harmful vapors. Hazardous wastes represent a major issue in the laboratory setting, causing organiza- tions such as the Occupational Safety and Health Administration (OSHA) and the Environ- mental Protection Agency (EPA) to install a number of regulations. While liquid waste disposal is relatively straightforward, gas and vapor wastes are more difficult to handle. A list of per- missible exposure limits (PEL’s), assigned by OSHA, outlines the standards for air quality per- taining to a number of different chemical vapors. However, OSHA admits “many of these lim- its are outdated,” and, “there are many substances for which OSHA does not have workplace exposure limits.”2 The dangers of inhaling many types of chemicals are not well understood because the effects of these chemicals usually develop over time and worsen with repeated exposure. For this reason, OSHA guidelines instruct that contact with chemicals should be minimized even when no health risk is expected with exposure. 3 In addition, OSHA suggests following more stringent air quality guidelines in order to limit hazards to workers, such as the recommended exposure limit (REL) guidelines distributed by the National Institute for Occu- pational Safety and Health (NIOSH), a subsidiary of the Centers for Disease Control (CDC). 4 A number of common HPLC solvents have lower REL values than PEL values, as represent- ed in Table 1. This highlights the importance of implementing a more efficient waste collection system for HPLC solvents. A recurring problem in laboratories, which contributes to the air quality, is open contain- ers of VOC liquids, which release chemical vapors into the air. Although most vapors are not acutely toxic, they can have long term effects, especially with repeated or consistent expo- sure. Not only does this create a health risk for those individuals, these vapors can interact with other chemicals in the lab leading to unpredictable effects. Finally, the vapors released from these substances can create an unpleasant and even noxious smell. A common, yet preventable, risk comes from open waste containers, which may con- tain a number of different types of fluids for disposal. In particular, HPLC wastes are often dis- posed from the tubes coming directly from the HPLC machine into an open container. Be- cause of the nature of HPLC use, these containers tend to be left open for long durations of time while VOC waste is slowly collected. 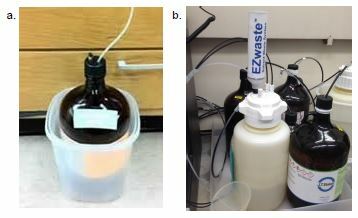 This mechanism of waste production makes open- ing and closing the waste bottle during use impractical.6 Leaving HPLC waste containers open can be dangerous for people who work in the lab because they are exposed to these vapors repeatedly. It is important to contain these vapors in order to provide a safe work environ- ment. In order to do so, a better method of collecting HPLC waste is necessary. Figure 1. A diagram of how a HPLC machine functions.9 Other variation of this simple method are used for different types of analyses. Solvent flows from a reservoir into a pump. It is then delivered to the column along with the sample where the two chemicals are separated based on affinity to the column. The detector deter- mines the retention time for each chemical which can be used to identify the chemicals if necessary. The sol- vent is then deposited into a waste container. The first step to resolving the issue of safe disposal of HPLC solvents is creating a closed system in which wastes can be immediately contained. Common ineffective practices to block the fumes from escaping include covering the top of the waste container with paraffin film or aluminum foil. These methods do not create a seal to prevent vapors from escaping. The most reliable method available is a closed waste system that is specifically designed to contain the liquid waste and vapors. Specialized caps for carboys or other containers are available which directly connect to the tubes from a HPLC machine. Although these devices are useful, built up vapors can prevent the proper operation of the HPLC machine.7 A vent must be present in the waste collection system in order to maintain proper HPLC function. It is not acceptable to leave an open air vent and simply allow the VOC emissions to escape. There must be an additional feature to filter VOC vapors from the air that leaves the waste system. In order to create an effective closed loop system of waste containment, which pre- vents the release of volatile vapors, a second step is required. An activated carbon filter is used in order to contain the vapors without creating built up pressure in the system. This will prevent the release of vapors in the lab and creates an easy disposal mechanism. Activated carbon acts through adsorption of volatile liquids or gases by binding to the mole- cules it contacts. VOC vapors can be contained and trapped by attaching a filter containing activated carbon to the closed loop waste system. This prevents the release of these chemi- cals and provides a simple disposal mechanism. In order to satisfy HPLC waste containment needs, an activated carbon filter is required. Figure 2. (a)10 In order to prevent the waste container from building up pressure, a vent must be present in the system as shown on the left side of the cap. However, this makes the system open to release vapors into the air, contaminating the lab. (b) In order to trap the hazardous chemical vapors, an activated carbon filter can be attached to a specialized cap, as demonstrated. This will trap VOC emissions but allow filtered air to exit the container and relieve pressure. By using a specialized closed waste containment system, such as the EZwasteTM sys- tem by Foxx Life Sciences, HPLC waste disposal will be properly handled. It was designed with the goal of vapor containment in mind, in order to improve air quality and prevent ad- verse health effects. This system uses a high density polyethylene (HDPE) carboy with a sealed cap where the waste disposal tubes from two HPLC machines can directly attach. In addition, an activated carbon filter attaches to the cap for containment and disposal of vapors produced by the liquid waste. Plugs are also included in order to maintain a complete seal when not all tube ports are in use. The activated carbon filter can be easily replaced and a regular sealed cap is provided for safe transport of the contained waste. This provides a way to remove a full waste container without disconnecting the HPLC tubing from the collection system cap. Additional benefits of a closed waste system include spill and accident preven- tion. Without open space for liquid or gas to escape, accidental spills or overflow of waste ma- terial are unlikely. 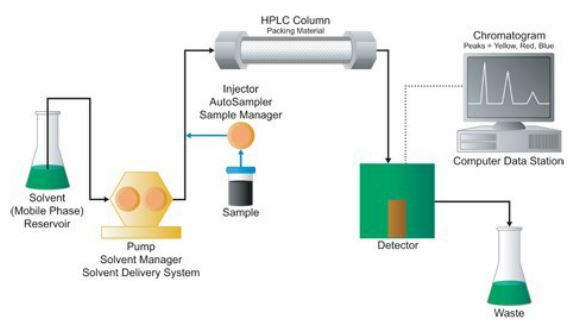 This system creates the most organized waste disposal mechanism for HPLC machines. Furthermore, this system has the potential to be adapted for use with any machine or technique involving liquid waste and should be especially considered anytime VOCs are being produced. In order to provide a safe work environment, better control of vapor wastes needs to be implemented. This is especially true with HPLC wastes, which often consist of volatile sub- stances, releasing chemical vapors into the lab. Without a proper system to contain these va- pors, lab employees are at risk for long term health effects. However, there is a simple way to control the release of these vapors. By using a closed waste system with an activated carbon filter, such as the EZwasteTM system, the vapors can be contained. Not only does this prevent the chemicals from being inhaled by workers, it also provides an easy mechanism of disposal for vapor wastes. In addition, this system is more organized than traditional techniques and will protect against spills and leaks. This system is a necessary addition to every lab to for im- proved solvent waste handling and disposal, as well as to decrease VOC vapor emissions. Work safety and health is a priority when dealing with hazardous substances, making this the ideal system for use in every lab.